Mary Goodbody helped me write Dinnertime Survival, and just this weekend her daughter Laura gave a small dinner party and made food from the book. Thanks, Laura! She wanted something easy and with familiar flavors so that she would feel confident making the recipe for the first time. 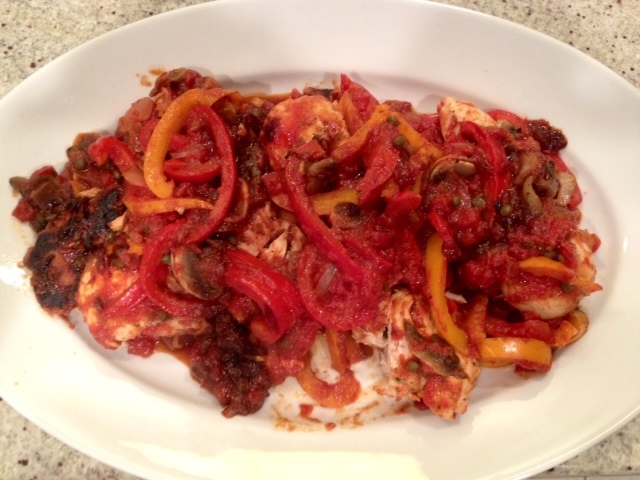 She chose Chicken Cacciatore on page 87 and the Kale Salad with Fennel and Almonds on page 36. The salad is dressed with the Lemon Vinaigrette on page 41. And then she sent us photos of her recipes from her Dinnertime Survival Dinner Party! The chicken was so easy, Laura said. She liked the kick from the red pepper flakes, which was subtle but still there. She made it with breasts rather than thighs. I learned to make this from my Italian husband, Greg, and have now decided it’s one of my family recipes. I make it with chicken thighs, which are an underutilized part of the bird and yet are so full of flavor and easy to find. If you prefer, you could use other chicken parts. Lightly season the chicken thighs with salt and pepper. Slice two of the garlic cloves and leave the remaining three whole. In a large, deep sauté pan, heat the oil over medium-high heat until it begins to smoke. Sear the chicken thighs on one side for 1 to 2 minutes, or until golden brown. Turn over and add the whole and sliced garlic with the onion, oregano, and red pepper flakes. Sauté the entire mixture for 2 to 3 minutes until the onions are light golden brown. Add the crushed tomatoes and capers and bring to a simmer. Loosely cover the pan and cook over medium heat for about 10 minutes or until the sauce is slightly thickened. Lay the peppers and mushrooms on top the chicken, partially cover the pan and cook for 10 to12 minutes, or until the peppers are tender. Do not stir. Remove the cover, raise heat slightly and cook for an additional 5 to 6 minutes until the sauce’s flavors come together and the chicken is cooked through. Add the chopped parsley, season with salt and pepper, and serve. Who would think raw kale could taste so good? Something this good for us couldn’t be so wonderful, right? But it is! My customers ask for it by name, and when we make it at Aux Delices, we add whatever dried fruit or toasted nuts we have on hand. I particularly like it with the almonds and cranberries. The lemony vinaigrette is the final brilliance; it perks up the salad as nothing else can. Stack as many of the kale leaves as you can easily handle at one time on top of each other on a cutting board. With a large sharp knife, slice them into thin strips, no more than 1/2-inch thick. Put the kale in a salad bowl. Add the fennel, almonds, and cranberries and toss to mix. 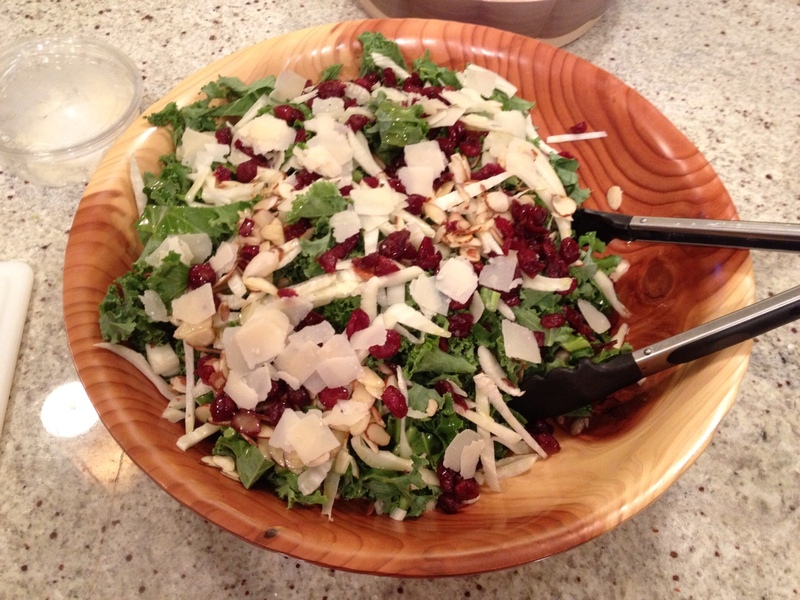 Scatter the shaved Parmesan over the salad and season to taste with salt and pepper. Sprinkle the vinaigrette over the salad, toss gently but thoroughly and serve.